Last week I wrote about my husband Olof’s surprising heart attack after he’d just spent a year getting down to his ideal weight, eschewing alcohol and bad carbs, and walking two hours a day. So much self-sacrifice and you still have a heart attack? Profoundly unfair. I could only wonder afterwards: should I just stick with chocolate and chardonnay, my food groups of choice? I would not want to risk a cardiac event. But the heart attack was “mouse nuts” (a favorite Olof expression presumably referring to the genitalia of tiny rodentia) compared to the brain bleed and neck and facial injuries he suffered doing a face plant into a piece of furniture on his way to our bedroom floor. Inga: I want to make sure that my address is listed in the city’s emergency database. Police Operator: Why wouldn’t it be? Inga: Well, even though the house has been here for almost 70 years, the trash people don’t have it listed in theirs. Operator (annoyed): We’re not associated with the trash people. 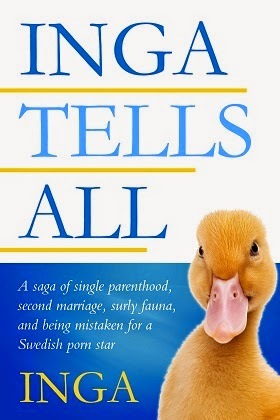 Inga: I just don’t want to have an emergency and find out that our address is not in your database. Could you confirm that you have this address? Operator: You’d have to call 911 to be sure. Inga: I really don’t want to call 911 if I don’t have an actual emergency. Could you check to see if the police department has this address in its database? Operator: Um, yup, we have it. Inga: So that means that 911 will have it too, right? So while I was on my land line with 911 to report Olof’s heart attack, I quickly used my cell phone to alert neighbors that I needed help. I ran to the front door as they rushed up: “Flag down the paramedics! Don’t let them go by!” Even the GPS on Lyft and Uber wants to send drivers 150 feet south of us. Speaking of neighbors, I mentioned last week that I will never be able to make it up to them for all the help they gave us in the form of taking over care of our dog Lily, delivering food, and providing immeasurable moral support. One of my neighbors even came over and dug up the colony of mushrooms that had sprouted on my front lawn so my totally non-discriminating dog wouldn’t eat them. Neighbors do NOT get better than that. We also had help on a more ethereal plane as well. Our 8-year-old granddaughter, who attends Catholic school although like 25% of her classmates is not Catholic, announced she was praying for Olof at every opportunity during the day. Apparently she got extra credit when he didn’t die. But she wasn’t alone in providing divine assistance. A year ago Christmas, I adopted an elephant named Shirley for my granddaughter from a group that rescues circus and zoo elephants. Granddaughter has been besotted with Shirley, follows her progress on-line, and informed me a few months ago that Shirley has having serious foot problems of the type that plague elephants who have been kept on concrete rather than dirt surfaces. I have made regular contributions to Shirley’s Foot Fund. Good karma really does come back to you: my granddaughter assured me that Shirley was praying for Olof too. That elephant clearly has connections. While in the Trauma ICU, a physical therapist came to assess Olof and after asking about his usual activities informed him that because of his neck injuries, he would not be able to do dishes until further notice. Geesh, Olof, I said. What some people will do to get out of household chores. Olof only became dismayed when an occupational therapist showed up too. He was afraid she was going to give him a new occupation. He’s very happily retired. Then the cardiac rehab folks came around. Somewhat of a dilemma in Olof’s case: he had already done everything – and more – that they normally recommend. But ultimately they decided that his brain bleed wasn’t getting worse and his heart situation seemed stable and I could monitor Olof at home. The trauma surgeon gave me a list of all the symptoms I should call 911 about and to NOT try to bring him to the ER myself. Was I totally, absolutely clear on that? Oh, you bet I was. And now at least I know that emergency services can find my house.